Made this for one of our daughters - she loves horses. Lots of work to make but well worth it. The top photo is not lite and the bottom photo shows it lite. 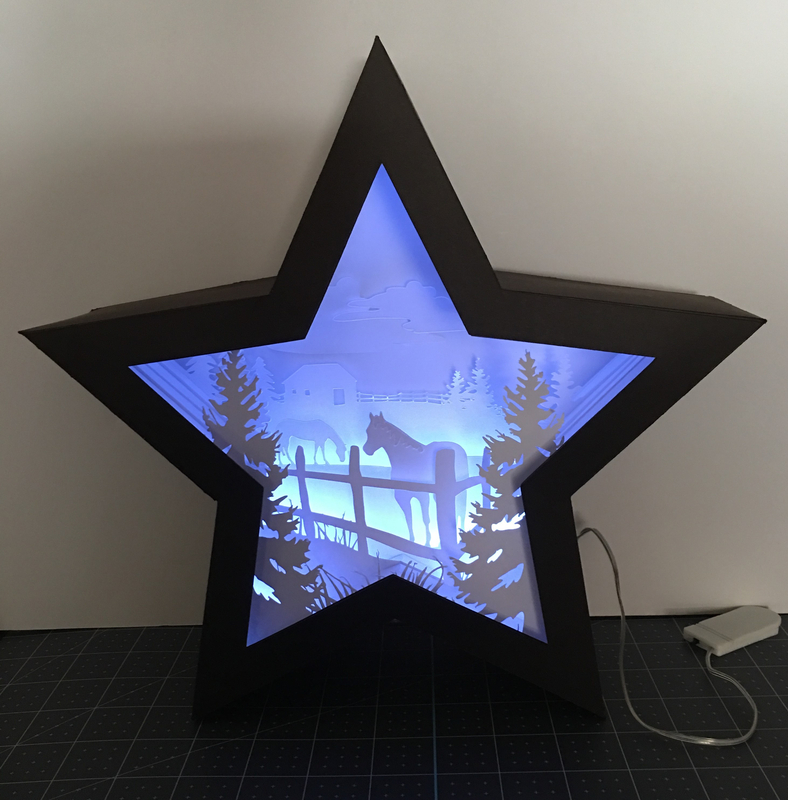 The file was gotten from 3D Cuts and is called Horses in Pasture Star Shadow Box. I am planning on make one with a deer scene for our other daughter who has a birthday this month. Beautiful Penny, thanks for showing. Thanks @MeFlick and @Liz_A. I will post the deer in the forest when I get it finish. Oh so beautiful! I bought that star box a while back but have always been stopped by the amount of work it takes. Yours is lovely: the black and white is so very elegant. Thank you Charo. It is a lot of work but so pretty - well worth it. Getting ready to do the Deer in the Forest. Several years ago I did the Nativity Star Frame. Have made several of those also. Very cool! Thank you for sharing with us! This is so pretty, I just now found it! Thanks for sharing the photos. @1cardcreator Thank you. Just take your time when putting it together. It can get a little confusing working with the inside layers. I had my hubby put the lights in it. These are so pretty when finished. I still haven't made the Deer in the Forest. Planning on doing it this weekend. 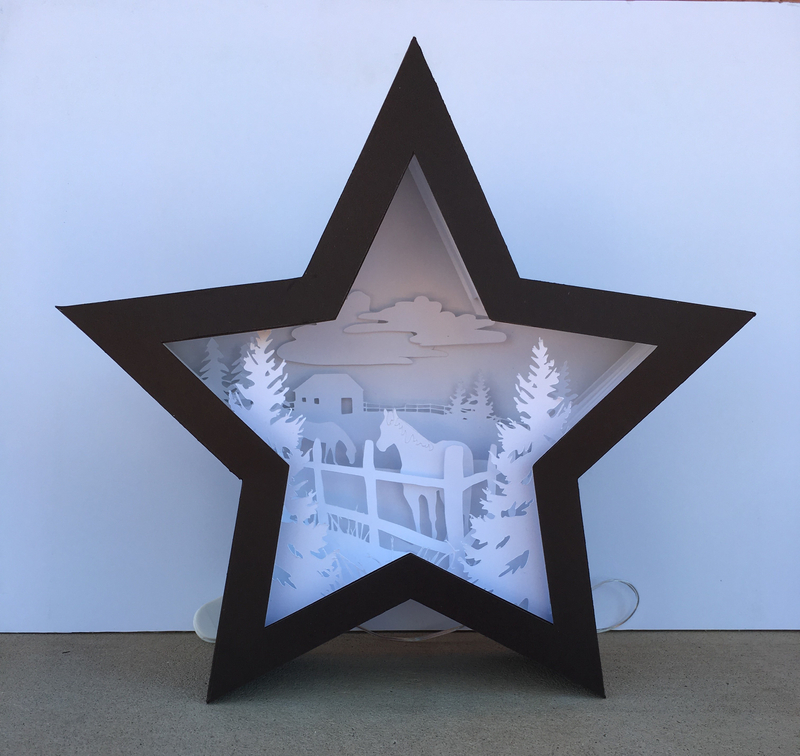 The Nativity Star is done a little different with the inside layers. I have made several Nativity Stars and given them as gifts. @1cardcreator ; I used double sided paper tape. I normally don't use tape - I like to glue my items together. With this, I not sure I would want to tackle it with glue. The only thing I did glue was the back panel. It had started lifting up at the corners a couple of days later, so I applied a small amount of glue. At the same time, I checked the frame around the front and applied a little glue in some places. Have fun making it. You need to post a photo after you are finished.